SUPERIOR STORAGE CAPACITY: PHM-PRO has the largest storage capacity in his class.It saves a lot of lost time so that harvesting increased up to 40%. DOUBLE WHEELS: Not to cause a compressive stress on the land, the tyre stepping surfaces enlarged and the left wheels were doubly designed. AUTOMATIC SEARCH SYSTEM: The extracting deepness and the scratches distances stay stable by the automatic scratch following system and so the harvesting can be faster without damages. TRANSMITTER DRUM SYSTEM: Transmitter drum diameter is increased so it prevents possibility of clogging while fast harvesting circumstance. BINDER SYSTEM: 3 rope binder unit is produced with special and hardened material.It can run continuous and also make uninterrupted bale. SUPERIOR H-CUT SYSTEM: H-cut and pickup widths are equalized and increased to 155 cm.Collected crop is chopped egual and continuons due to this feature. WORK CABINET: Rope storege with 6 pieces rope capacity provide long time and uninterrupted working opportunities. DIGITAL BALE COUNTER: Digital bale counter displays the daily and total bale numbers which is made. EQUIPMENT CABINET: It provides operator to keep his equipment in it and can be used as rope storage as well. BINDER SYSTEM: 2 rope binder unit is produced with special and hardened material.It can run continuous and also make uninterrupted bale. HIGH WORKING WIDTH: 170 cm collecting unit width provides stable and smooth product flow with fast operating speed.At the same time large grass clumps can be easily collected. WORK CABINET: Rope storage with 6 pieces rope capacity provide long time and uninterrupted working opportunities. EQUIPMENT CABINET: It provides operator to keep his equipment in it and it can be used as rope storage as well. TWINE SYSTEMS: There is 2 rope binding system in the BLY-155 and there is 2 row wire binding system in the model of BLY-155W. WORKING WIDTH: 155 cm pickup widt provides steady and accurate product stream.At the same time, wide swathes can be collected easily. ROPE CABINET: Rope storage with 6 pieces rope capacity provide long time and uninterrupted working opportunities. 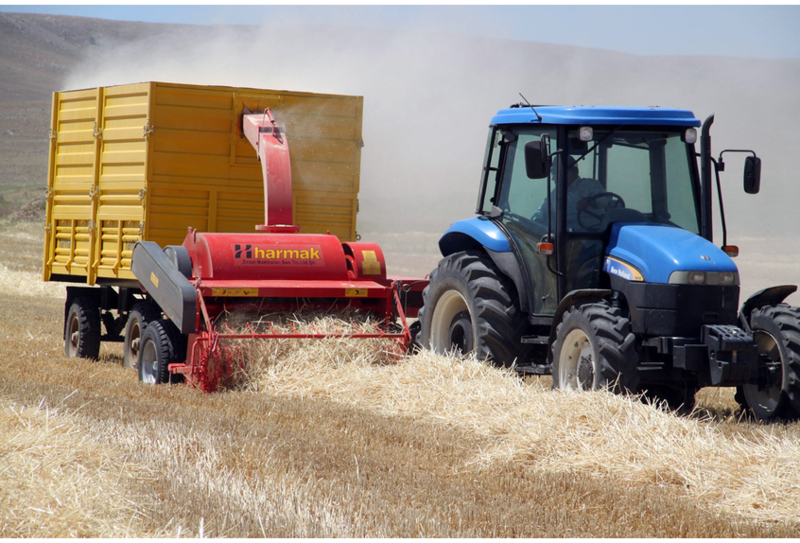 AUTOMATIC STEM COLLECTION AND STRAW MAKING MACHINE: The task of the machine is gathering automaticly the straws of the wheat,barley,oath,rye,soyabens,corn,clowers etc. which are left in the fields as rows or aggregation and make them fodder automatically and fill up the special straw trailor which is hooked to the back thanks to aspirator. 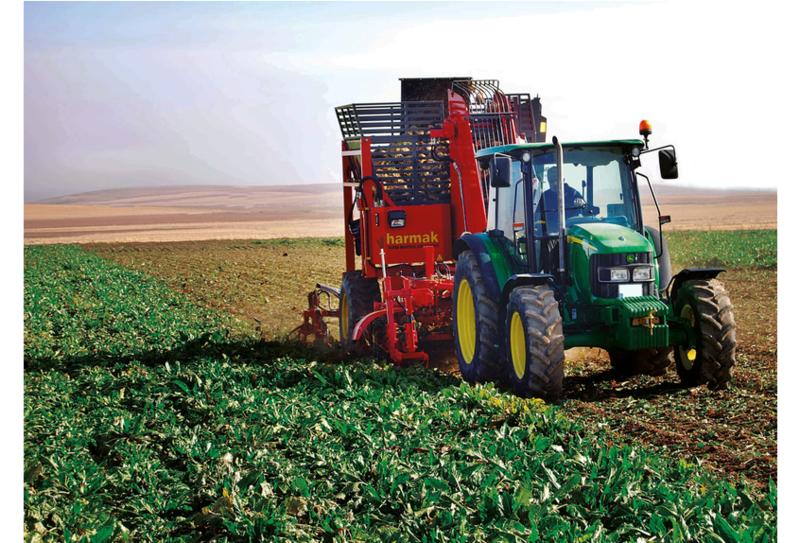 SUPERIOR WORKING WIDTH: 190 cm collectıng width increased the gathering performance at the same time, the fodder which is left in the fields are minimized thanks to the side rake. EXCALTED BLENDING CAPABILITY: Stem chopping capability is increased with the 6 rows drum system which has 66 pieces fingers on it and 137 cm heigh concave sieve.Further, the drum fingers are produced in bolted fixing in order to provide double sides usage. STRONG ASPIRATOR SYSTEM: 60 cm diameter of the aspirator fan with perfect vacuum and pressing volume is especially designed to prevent all issues while converting the green fodder plants as clover ,vetch, sainfoin etc.to.straw. EXCELLENT MANEUVERABILITY: The special designed rotating head and draw beam in the model of DM-300 present great maneuverability in all kind of ground conditions.Further,cutting head can managed hydraulically so it provides big opportunity to turn over the edge of farm. WORKING ABILITY OF TRACTORS BOTH SIDES: The machine can be work both sides of tractor as right and left sides by controller of hydraulic system in DM-300 model. CONDITIONER: Zigzag patterned rubber roller is consisted in conditioner system.These rollers provide mown grass and leafs to dry simultaneously by creating a middle notch effect.It assures excellent conditioning because of the special gearbox system is bonded on the two rollers in conditioner. SUSPENSION SYSTEMS: Suspension systems provide mowing head to behave according to terrain conditions and also accurate adaptations of the ground. 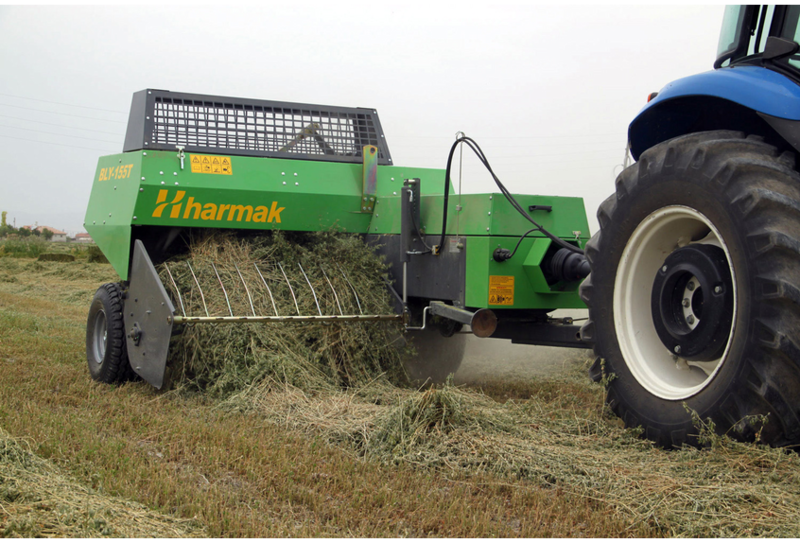 CUTTING DISC: The knifes which are situated on the discs in the disc mowing system provide to chopping the crop from the optimal height.Crop density does not effect the mowing quality and smoothness. ADJUSTABLE OPTIMAL WORKING WIDTH: Collecting width can be adjusted by hydraulic systes as automatically. EXCELLENT ADAPTATION TO TERRAINS: The wheels under the rotories provide perfect adaptations and excellent collection in even short ,heavy and wet grass in uneven and slope terrain conditions. EASY TO TRANSPORT: The wings automatically come to an upright position thanks to hydraulic system so it exhibits smooth transportation .It is suitable for bridges standards due to the height which is less than 4 meter in vertical position.Collecting arms of rake has the feature of assembling and disassembling. EASY DISASSEMBLING OF ROTOR ARM: Just undo three bolts to disasseble rotor arm and rotor casing easy and guick.So that rotor and rotor arm maintenance can be effortless. HEIGHT ADJUSTMENT OF ROTOR: Depending on crop and terrain, rotor height can adjust easy and comfy as well. 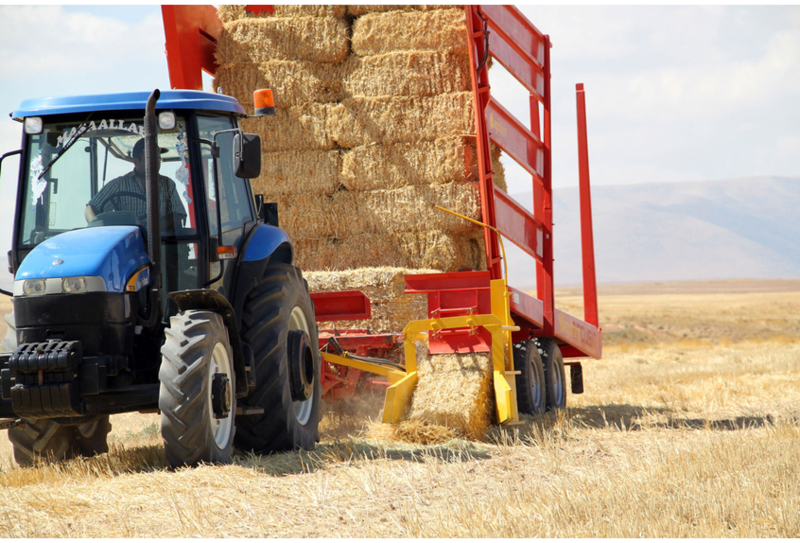 BALE COLLECTION TRAILER: Automatic loading system,bale dedection sensors and platforms which work independently but in harmony provides excellent and fast bale collections. SAFE AND CONFORTABLE WORK OPPORTUNITY: Upright position of first platform offers safe and confortable operation due to side wings and rear retaining forks.During the transportation,because of the unlocked front cover provides safe and confortable transportation. PROFER STOWING: BT-168 bale collection trailer offers a neat stowage facility within 3-4 minitus due to upright position of central platform. SAVING TIME AND COST: BT-168 add value to your working capacity in terms of time,scheme and cost.Direction and controls can be made by remote controller on BT-16 model. ROTARY TILLERS:It is a versatile machine that can be used in many processes such as tillage,stubble disruption, seed bed preparation,mixing plant residus with soil,increasing humic with orgaic fertilizer, mechanically fighting with mechanical herbs, saving time and fuel. 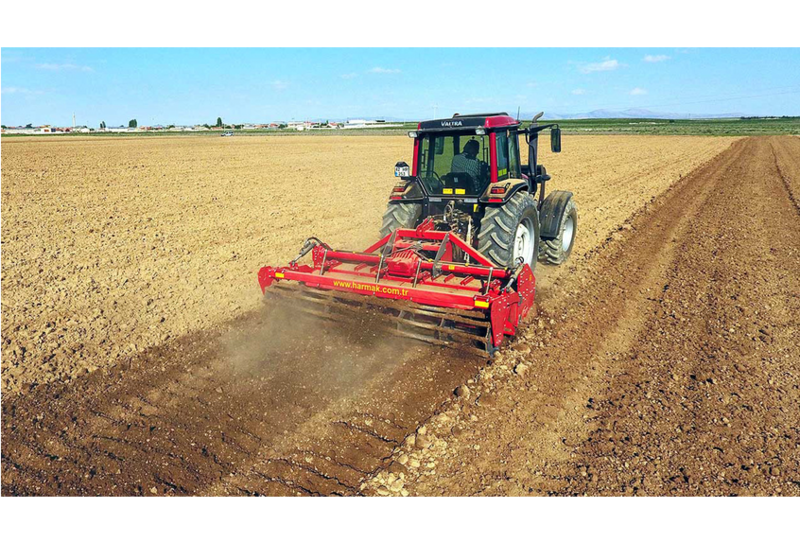 ROLLER:The ability to compress the soil makes it possible to protect the existing moisture. GEARBOX:A powerful gearbox on the machine offering 4 different speed options. MACHINE DEPTH ADJUSTMENT:The control leg on the sides of the machine allow easy adjusment of the desired depth from 5 to 27 cm.